I hope you are having a wonderful day! 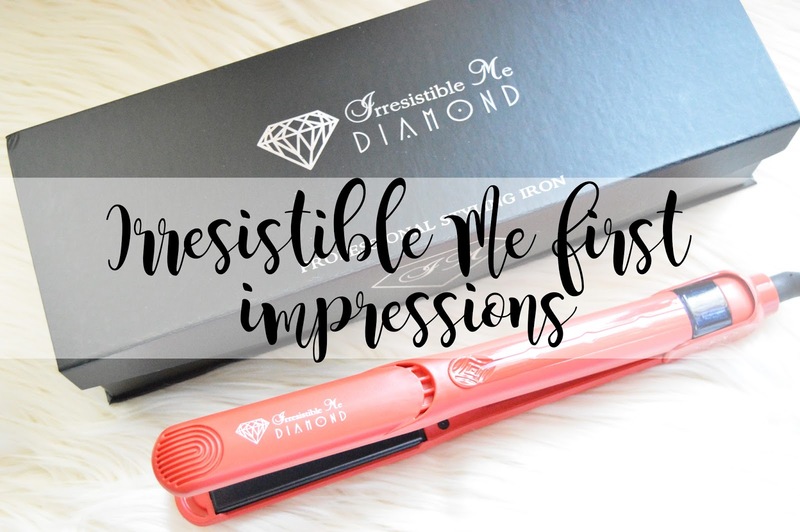 Recently Madison from Irresistible Me kindly sent me their Diamond Ceramic Flat Iron and I absolutely love it! I have always used Babyliss or Remington flat iron's to straighten my hair and I find these absolutely great! I've never had an issue with them and even after years on end they've always worked for me! It's just nice to have an upgrade of something every now and then! I was very intrigued by the Irresistible Me Flat Hair Iron as so many people have mentioned how they are better than GHD's. I personally have never used a pair of GHD's as being a student, I've never had the money to purchase them myself! However, they're absolutely beautiful and they have always been on my wish list! Today I am bringing you my first impressions of the Diamond Flat Iron and my opinion of this hair syler! "The Diamond Professional Flat Iron is our next-generation, digital, SMART styling iron featuring unique DIAMOND Hi-Tech, which coats the floating ceramic plates with crushed diamond particles mixed with tourmaline. The diamond and tourmaline technology will protect your hair and keep all the natural hair oils, colour and moisture in, leaving your hair healthy, shiny and frizz free. The styling will last longer against air humidity and everyday stress." "A 360° mobile cord that swivels around following your every move. A thumb print and cool tips for a steady grip and to avoid burning your fingers. All buttons are on the inside so you don't accidentally change the settings. This shuts down automatically in 30 minutes. The iron gets hot (450F/230C) really fast, in up to 15 seconds. It has an intelligent heat display that lets you see the temperature all the time. It is super light and comes in a beautifully designed box with magnetic closing that you can use to store it. It automatically changes the temperature display to Celsius or Fahrenheit, depending on the supplied voltage, making it perfect for travelling. The 1'' floating plate self-adjusts, eliminating any pressure points, so that the iron can work through your hair smoothly without pulling." Although red isn't my favourite colour, I feel like this is a very unique colour to Irresistible Me as you very rarely see a red flat Iron. It's a fairly pretty colour too and stands out! I am always losing my Remington Hair Straighteners as they're black and difficult to find if they've fallen off my chest of drawers! It's an absolute nightmare. However, this won't be the case with these. I also love how light weight these are. Unfortunately with many flat iron's, due to what they're made of they can be rather heavy, especially the older ones (my pair are around four years old, maybe older). Therefore, they do not include the light weight materials which this pair has. As they mention in the features, the Diamond Flat Iron heats up very quickly and I mean, ridiculously quick! You can turn these on, brush your hair and once you're done, they're already heated up to the temperature which you require which is insanely good, especially if you are in a rush! I found with straighteners which I used to use, the one aspect I hated about them were how long they took to heat up, it would be minutes until they were at the correct heat which wasn't ideal before school! Unfortunately, although these are light weight and pretty, they do look rather tacky. As they're made of some sort of plastic, they provide the light weight materials but they look like they'll break rather easily, especially if you drop them or accidentally stand on them (Which I have done before). If these were made of possibly a metal of some sort, it would provide consumers of the idea that these are worth the money which they paid for them. For $149, are they worth if it they're plastic? I'm not sure, we shall see how long they last! As well as this, being an American company, you do require an adaptor to be able to use them in the UK which isn't an issue. However, I had a struggle pushing these into my adaptor, they just didn't want to go into the holes with ease. Whether this was a fault with the Flat Iron's American adaptor, or the UK adaptor, I'm not entirely sure! However, it would be great if they provided an Adaptor with these inside the box seeing as they do ship to the UK, you would expect it! Last but not least, although I wouldn't say this is a negative aspect, it's just a thought of redesign. As these are called the Diamond Flat Iron, wouldn't it be incredible if they were silver, and sparkly? Possibly? Giving the effect of being diamond? Having the stronger but light weight materials, and a colour which matches the name of these, I believe they would be a great seller! Similar to Irresistible Me Sapphire 8 in 1 Hair Curlers, these are blue which is what a Sapphire is. Overall, I am impressed with how quickly this hair iron heated up, I wasn't expecting it to heat up as quickly as it did! After using these for the first time, they took a lot longer to straighten my hair compared to my Remington Hair Straighteners, however is this because they were brand new and needed using more than once to get them working properly? This is a possible factor! I'll let you know in my full review very soon! This blog post features product/s which were sent to me for review purpose however all opinions are my own and completely honest. What's your favourite brand for hair straighteners/flat irons? Fancy treating yourself over on Cocon Lane? Use the code "kimberleyjessica20" at the checkout to redeem 20% off! The Bloggers Christmas Beauty Brawl!